Supply chains are inherently susceptible to risky events. 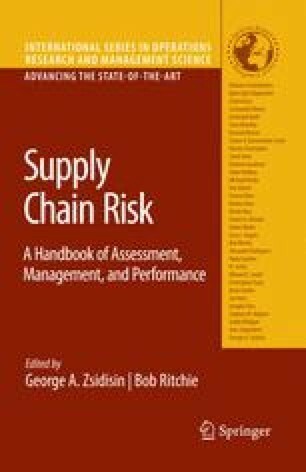 Earlier articles in supply chain management by Kraljic (1983) and Treleven, and Schweickhart (1988) stressed the importance to consider the risks arising from interconnected flows of material, information and funds in inter-organizational networks. However, during the last several years, the interest in this topic has significantly gained momentum. A large body of recent literature reports on events that disrupted supply chains and on their negative impact on businesses. These reports are paralleled by numerous articles from researchers and practitioners proposing best practices, guidelines, and concepts for risk management strategies that aim to ultimately create resilient supply chains. But what actually fuelled this recent attention to supply chain risks and their management? There are arguably at least two significant factors.